'cutting of the ribbon' for the Santa Monica Waves Netball Club new permanent netball courts. These were previously two tennis courts which have been converted into netball courts with permanent goal posts. 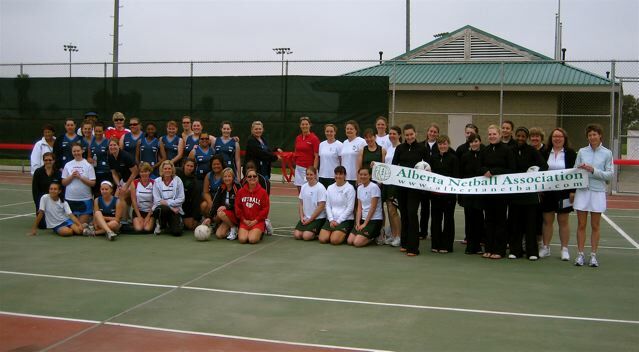 They did boast about being the first club on the West Coast to have two netball courts but we know better up here in the Northwest! I did point that out to them that we have had two courts for about a month now! Our first game was against a Santa Monica Waves team, Tidal. This was a hard fought game which slipped away from us in the third quarter but in true ECNC style we did not give up and fought back to win the fourth quarter but unfortunately not enough to win the game. Final score 18/31 (quarter scores: 6/10, 7/14, 11/26, 18/31). Comets and the heat of the day won in the end. Final score 18/28 (quarter scores: 4/10, 5/4, 5/6, 4/8). Even though the final scores are not in our favor these games are a valuable experience for our club members as it exposes them to a different level of competition netball. I am sure ever member of the team has come away learning something while having fun at the same time. The next Pacific Coast Netball League games will be hosted in Seattle by ECNC on Saturday, August 25.